Germany: Nazis pass a law allowing forced abortions on women to prevent them from passing on bad hereditary diseases. 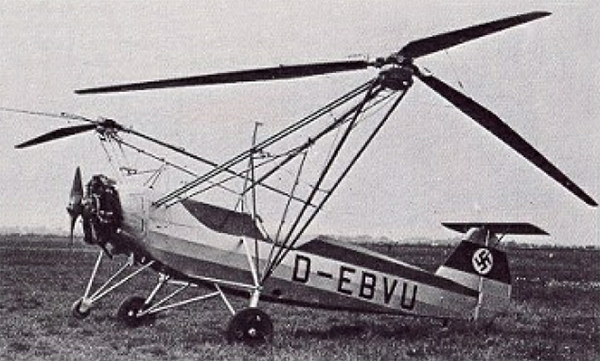 Germany: The initial flight takes place of the Focke-Wulf Fw 61, the first practical helicopter. A single, radial engine drives twin rotors, set on outriggers to the left and right of the fuselage. The counter-rotation of the two rotors solves the problem of torque-reaction. Only two of these prototypes were produced. In February 1938, the Fw 61 was demonstrated by Hanna Reitsch indoors at the Deutschlandhalle sports stadium in Berlin, Germany. It subsequently set several records for altitude, speed and flight duration, culminating, in June 1938, with an altitude record of 3,427 m (11,243 ft) and a straight line flight record of 230 km (143 mi). Neither of the two helicopters prototypes were used militarily and neither appear to have survived World War II, their demise unknown. Germany: The German military begins excluding Jews from military service. Spain: Day 345 of 985 of the Spanish Civil War. Spain: Day 710 of 985 of the Spanish Civil War. CBI - China: Day 355 of 2,987 of the 2nd Sino-Japanese War. Day 16 of 139 of the Battle of Wuhan. 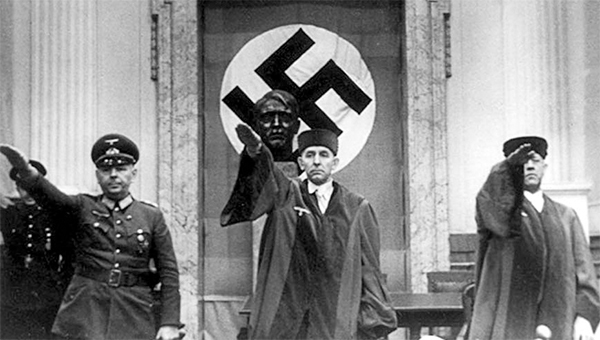 Germany: The Gestapo orders all Czechs who are deemed as unwilling to work, politically active or deemed as having anti-German beliefs are to be placed in concentration camps. CBI - China: Day 720 of 2,987 of the 2nd Sino-Japanese War. Day 13 of 68 of the Battle of Tianjin. Day 6 of 7 of Operation SWATOW, the Japanese offensive to take Shantou in southern China. CBI - Mongolia: Day 47 of 129 of the Battle of Khalkhin Gol, a border dispute between the Soviet Union and Japan. USA: The Packard Motor Car Company of Detroit, Michigan, receives a license to build P-51 Mustang fighters with Rolls-Royce Merlin engines. Atlantic: The United Kingdom extends their blockade of war materials and food to include all of France. Atlantic: The Norwegian merchant ship CRUX is sunk 300 miles west of Cape St Vincent, Portugal, by a German submarine. Atlantic: German sub U-29 stops the Greek ship DIMITRIS off Cape Finisterre, Spain. After the crew abandons ship, it is sunk by gunfire. ETO - UK: General Charles de Gaulle creates the French Volunteer Legion in England. Eastern Front: The Soviet Union makes an ultimatum demanding territory from Romania in Bessarabia and northern Bukovina. MTO - Turkey: Turkey announces that they will stay out of the war. East Africa: Day 17 of 537 of Italy's East African campaign in the lands south of Egypt. CBI - China: Day 1,086 of 2,987 of the 2nd Sino-Japanese War. Day 225 of 381 of the Battle of South Guangxi. ETO - Spain: Spain officially begins to organize a unit of volunteers to fight in Russia on the side of the Axis. Russian Front - Finland: Day 5 of 164 of the Battle of Hanko. Finland declares war on the Soviet Union. Russian Front: Day 5 of 167 of Germany's Operation BARBAROSSA, the invasion of the USSR. Russian Front - Lithuania: Day 4 of 5 of the Battle of Raseiniai. Other German units capture Dünaburg in Latvia as the Luftwaffe begins bombing Leningrad. Russian Front - Center: Day 5 of 12 of the Battle of Minsk. The fighting gets heavy as the Germans close in on the surrounded Soviet troops at Bialystok. Russian Front - Center: Day 5 of 8 of the Battle of Brest, Russia. Russian Front - South: Day 4 of 8 of the Battle of Brody, Poland. MTO - Libya: Day 78 of 256 of the Siege of Tobruk. Middle East: Day 19 of 37 of the Battle for Syria and Lebanon. East Africa: Day 382 of 537 of Italy's East African campaign in the lands south of Egypt. CBI - China: Day 1,451 of 2,987 of the 2nd Sino-Japanese War. USA: The Grumman XF6F-3 Hellcat prototype makes its maiden flight. It goes on to be, arguably, the most significant Allied carrier fighter of the war. Atlantic: Day 164 of 169 of Germany's Second "Happy Time," during which U-boats sink 609 Allied ships with little risk. Russian Front - North: Day 292 of 872 of the Siege of Leningrad. Russian Front - North: Day 53 of 658 of the Siege of the Kholm Pocket. Russian Front - Center: Day 29 of 31 of Operation KREMLIN, a German diversion to trick the Soviets into thinking Moscow is their main objective instead of Stalingrad and the Caucasus. In Ukraine, German troops capture Kupyansk over the river Oskel, for use as a jump-off point for their summer offensive. Russian Front - South: Day 240 of 248 of the Siege of Sevastopol, Crimean Peninsula. The Germans keep pressing on the Soviet's east line. MTO - Malta: The Italians are able to step up their air attacks on Malta by withdrawing warplanes from Libya to Sicily. MTO - Egypt: Italian troops reach Mersa Matruh in the afternoon and engage the Indian 10th Infantry Division. To the south, German forces move toward Minqar Qaim. MTO - Libya: US HALPRO B-24s fly a diversion for an RAF attack on merchant vessels at Tobruk. East Africa: Day 53 of 186 of the Battle of Madagascar. CBI - China: Day 1,816 of 2,987 of the 2nd Sino-Japanese War. Day 43 of 124 of Japan's Zhejiang-Jiangxi Campaign, launched to punish anyone suspected of aiding the Doolittle raiders in China. Roughly 250,000 Chinese will be killed. PTO - Alaska: Day 20 of 435 of the Battle of Kiska, Aleutian Islands. US 11th Air Force B-24s drop incendiary bombs on installations at Kiska Harbor. PTO - Malaya: Day 128 of 357 of the Battle of Timor Island. PTO - Marshall Islands: US 7th Air Force night bombs Japanese installations on Wake Island. Germany: Berlin war widow Marianne Elise Kurchner, who worked at an armaments factory, is put to death by guillotine for telling a Hitler joke. Hitler and Goering are standing atop the Berlin radio tower. Hitler says he wants to do something to put a smile on Berliners' faces. So Goering says, "Why don't you jump?" Marianne Elise Kurchner was called up before the People's Court (Volksgerichtshof), whose president, Roland Freisler, was famous for both his long raving speeches berating defendants, and his death sentences. She admitted to telling the joke but said she hadn't been herself at the time, feeling bitter about the recent loss of her husband at the front. Freisler would have none of it and she was immediately sentenced to the guillotine. ETO - France: US 8th Air Force: B-17s bomb airfields in France. Russian Front - North: Day 657 of 872 of the Siege of Leningrad. Russian Front - North: Day 418 of 658 of the Siege of the Kholm Pocket. MTO - Italy: US 9th Air Force RAF heavy bombers strike Messina, Sicily. MTO - Italy: US 12th Air Force RAF Wellingtons night bomb the oil refinery at Bari. CBI - China: Day 2,181 of 2,987 of the 2nd Sino-Japanese War. PTO: Day 31 of 47 adrift in a raft for the survivors of B-24 GREEN HORNET that crashed 850 miles from Hawaii. PTO - Alaska: Day 385 of 435 of the Battle of Kiska, Aleutian Islands. US 11th Air Force hits Kiska and Little Kiska seven times during the day. PTO - Japan: The submarine USS RUNNER becomes missing, presumed lost, while on patrol off northern Japan. PTO - New Guinea: Day 66 of 148 of the 2nd Battle of Lae-Salamaua. US 5th and 13th Air Forces provide air support. PTO - Solomon Islands: Day 7 of 67 of the Battle of New Georgia. US 13th Air Force provides air support. ETO - UK: Day 14 of 86 of the V-1 "Buzz Bomb" offensive on Britain. ETO - Denmark: In response to recent sabotage action in Copenhagen, the Germans introduce a curfew between 8pm and 5am. As a result, the citizens of Copenhagen begin a massive general strike. ETO - France: Day 21 of 49 of Operation OVERLORD, the Allied invasion of Normandy, France, known forever simply as D-Day. D-Day+20: Allied Air Forces provide air support. ETO - France: Day 21 of 62 of the Battle of Caen. ETO - France: Day 21 of 25 of the Battle of Cherbourg. US troops capture the German General commanding at Cherbourg. Russian Front - Finland: Day 2 of 15 of the Battle of Tali-Ihantala. This becomes the largest battle in Scandinavian history. Russian Front - Finland: Day 6 of 50 of the Battle of Karelia. Soviet troops continue their offensive against the Finns in eastern Karelia between Lake Ladoga and Lake Onega in northern Russia. Russian Front - Finland: Day 4 of 5 of the Battle of Lake Ladoga. Russian Front - North: Day 146 of 191 of the Battle of the Narva Isthmus, Estonia. Both German and Soviet troops remain locked in their defensive positions. Russian Front - Center: Day 4 of 6 of the Battle of Orsha, Belarus. The Soviets capture Vitebsk. Russian Front - Center: Day 4 of 6 of the Battle of Mogilev, Belarus. The Soviets have the Germans surrounded. Russian Front - Center: Day 3 of 6 of the Battle of Bobruysk, Belarus. Soviets have trapped a massive number of Germans defending here. MTO - Austria: US 15th Air Force attacks targets in the area of Vienna. MTO - Italy: Day 11 of 34 of the Battle of Ancona (north of Rome). Allied Air Forces provide air support. CBI - Burma: Day 114 of 166 of the UK's Operation THURSDAY. With Chinese help, the Gurkha troops of the Chindits capture Mogaung. CBI - Burma: Day 109 of 147 of the Battle of Myitkyina. US 10th Air Force provides air support. CBI - Burma: Day 87 of 302 of the Chinese Salween Offensive. US 14th Air Force provides air support. CBI - China: Day 2,547 of 2,987 of the 2nd Sino-Japanese War. Day 71 of 259 of Japan's Operation ICHI-GO. Day 5 of 48 of the Battle of Hengyang. The Japanese reach the city but are pushed back by the Chinese 10th Army. CBI - India: Day 111 of 118 of the Battle of Imphal-Kohima. The Japanese continue retreating back into Burma. PTO - Caroline Islands: US 7th Air Force bombs targets on Ponape and Nauru Islands. PTO - Mariana Islands: Day 12 of 25 of the Battle of Saipan. US 7th Air Force provides air support. PTO - New Guinea: Day 31 of 83 of the Battle of Biak. Although the battle is pretty much over, there are still 3,000 Japanese soldiers on the island who won't give up. PTO - New Guinea: Day 195 of 597 of the Battle of New Britain. US 13th Air Force provides air support. PTO - New Guinea: Day 66 of 481 of the Battle of Western New Guinea. 5th Air Force provides air support. PTO - New Guinea: Day 13 of 80 of the Battle of Lone Tree Hill. PTO - Solomon Islands: Day 239 of 295 of the Battle of the Bougainville Islands. US 13th Air Force provides air support. CBI - China: Day 2,912 of 2,987 of the 2nd Sino-Japanese War. Day 87 of 91 of the Battle of Zhijiang. US 14th Air Force provides air support. Japanese troops continue pulling out of China. PTO - Borneo: Day 17 of 67 of the Battle of North Borneo. US 5th and 13th Air Forces provide air support. The US coastal minesweepers YMS-39 and YMS-365 hit mines and are both sunk off Balikpapan. PTO - Japan: US 20th Air Force B-29s bomb Japanese industrial targets at Osaka, Akashi, Nagoya, Kagamigahara, Eitoku and Nagoya. PTO - New Guinea: Day 547 of 597 of the Battle of New Britain. US 10th Air Force provides air support. PTO - New Guinea: Day 431 of 481 of the Battle of Western New Guinea. US 10th Air Force provides air support. PTO - Philippines: Day 249 of 299 of the 2nd Battle of the Philippines, aka the Liberation of the Philippines or the Philippines Campaign. PTO - Philippines: Day 194 of 244 of the Battle of Luzon. 5th Air Force provides air support. PTO - Philippines: Day 109 of 159 of the Battle of Mindanao Island. 5th Air Force provides air support. PTO - Philippines: Day 101 of 135 of the Battle of the Visayas region. US 5th and 7th Air Forces provide air support. In Nazi Germany, telling jokes about Hitler could get you killed. Humor was widespread during the Third Reich, but only in whispers while looking over their shoulder for someone that might turn them in to the Gestapo.